Senator George Allen gives his concession speech after 2 days of keeping the nation waiting and wondering whether or not the Democrats would control both chambers of Congress. If it hadn't have been for George's "macaca moment", would he be giving this speech today? The world may never know. I would bet he seriously regrets it though. 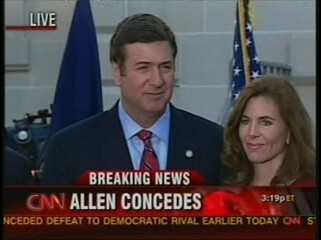 This election was supposed to be a warm-up for a much anticipated 2008 Presidential run for Allen. If you had told me four months ago that he would be handing his seat over to Jim Webb, I would have never believed it. To his credit, the senator was very gracious. Farewell, Macaca.